Those looking for the quickest, most scenic entry into the region will enjoy getting to Monastero Santa Rosa via helicopter, a truly unique experience. 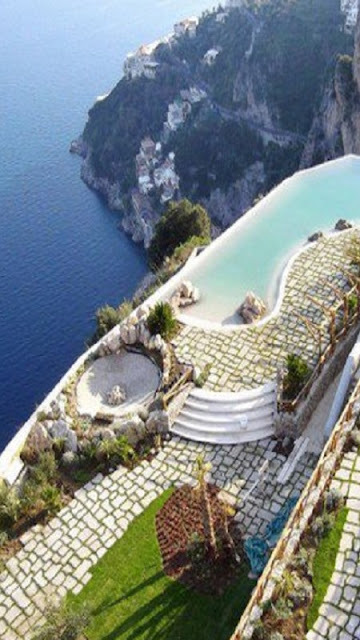 A 20-minute tour flies over Naples, Vesuvius, Capri, Ischia and the sites of Herculaneum and Pompeii, on to Sorrento and then marvel at the Amalfi Coast starting from Positano en route to Amalfi, landing just below the Monastero Santa Rosa Hotel & Spa which is perched on a cliff, almost a natural landing from the sky. Leaving the airport, DO NOT TAKE THE FIRST EXIT signposted “TANGENZIALE”, keep driving for about 50 meters pass the roundabout and TAKE THE SECOND EXIT signposted “AUTOSTRADA”, following the sign Salerno – Reggio Calabria you will enter the A3 motorway. Head south towards – Salerno. Take the exit at Castellammare di Stabia gate. From here, follow the signs for Gragnano – Agerola then Costiera Amalfitana. Once in Agerola, drive down the hill through Furore, until you reach Conca dei Marini. You will find the Hotel on the right hand-side just before the tunnel. Time to destination is approx. 80 min. Take the A1 to Naples, exit on the A3 signposted Salerno – Reggio Calabria. Head south towards Salerno. Take exit at Castellammare di Stabia gate. From here, follow the signs to Gragnano – Agerola – Costiera Amalfitana. Once in Agerola, drive down the hill through Furore, until you reach Conca dei Marini. You will find the Hotel on the right hand-side just before the tunnel. Take the “Reggio Calabria – Salerno” motorway and stay on this road until you reach the exit Salerno. Follow the sign to the Costiera Amalfitana. Continue on this road and pass Amalfi, until you reach Conca Dei Marini. The nearest touristic harbour is Amalfi, and a pick-up service from the hotel can be arranged. Naples Central Railway Station ( 60 km ) or Salerno ( 35 km ), trains arriving from Milan, Venice, Florence and Rome. The hotel can arrange for pickups from any of the nearby train stations. To get a better feel for our exact location, view our Local Area Map, or get more even detail from the Google Map aerial view. You can also get Driving Directions to and from Monastero Santa Rosa Hotel & Spa.